After having cleaned the house yesterday, I decided not to cook. Hubby had a hankering for pork chops so we decided to go to the Boulder Creek Steakhouse and order some take-out. We ordered 2 Cripple Creek Chops with sweet baked potato and two orders of Chicken Tenders and fries- bringing our total to $40.25. I happily plonked down two twenties and a quarter because it meant not cooking OR doing dishes (NO CLEAN UP)... boy was I wrong. We all sit down to eat at around 5:30 (our usual dinnertime). I wolf down my grub while the girls daintily dip their chicken into little ketchup pools. All done by 6:00. I toss the remaining food & bones into the trash and we all proceed upstairs to play the newest Kingdom Hearts game. At about 7:30, my daughter complains of stomach pains. She lays down on my side of the bed to watch" wheel of fortune". About ten minutes later, she gets up and goes to her room to take a nap. Minutes later, she wakes up startled and makes a bee line to the can. To make a long story short, I spent 6 hours intermittently cleaning up projectile fluids in the bathroom AND carpet. Her first and second set of PJs are destroyed. Thank you, BOULDER CREEK, for messing up my evening. I have spent the night caring for two instead of one. This morning (4:37am) my youngest booted me out of bed. Apparently she wanted MY SIDE of the bed. Oh well. It's okay though.. the sun is out, it's a brand new day, and I am feeling invigorated. I learned another important credit lesson recently. We have ahome improvement store credit account and received a specialoffer several months ago for no payments/no interest for sixmonths. We made a somewhat large purchase, thinking we wouldbe able to pay it off before the end of the six-month period.When we couldn't pay off the total balance, we were surprisedto find out that the interest didn't begin after six months,as the payments did. We were charged the interest that wouldhave accumulated during the six months. My husband brown bags his lunch, but the other four men in ourfamily-owned business often bring back carry out. I set out abasket and asked for them to put the extra condiment packagesin it. At the end of a month, I squeezed out the packages just to see how much I had collected. I had enough ketchup torefill two large bottles and enough mustard to refill one bottle. In addition, I had more salt, soy sauce, taco sauce,mayo, and relish than our family uses in a month. And I evenleft some in the basket for their use! I also found the packages handy for impromptu picnics and BBQs at the park. Yesterday, I found a penny on my way to Best Buy (in the parking lot). The night before I found a penny at 10pm on campus (CSI barely has ANY lights on at night!!) on my way to the car. I'll update more throughout the day. how, when and where to use those little pieces of "paper gold"
and accessible so they don't ever miss an unadvertised sale. when used in conjunction with coupons and sales. the weekly flyers and then using coupons for those items. you may lose out on thousands of dollars in savings a year. means everyone should consider them as a money-saving option. a little brand name loyalty stand in their way of savings. entire cost you paid for the item and get to keep the product. and requesting the price scan guarantee, when applicable. available for everything from beef to toothpaste to pies. patiently for their gratifying reward. 2. Prepare a list of things you need before you head to the store (complete with totals and cash equivalent). Keep all cards and extra cash in your house so you won't overspend or get side-tracked. Marketing principles count on side-tracking (aka impulse shopping). 4. Keep your house clean! Re-arranging your clutter will only make your mind jumble and cave in eventually. It takes less time to clean a house once your baubles are in order than to fix a tornado-ridden domicile. I've even instructed the children to take charge of their rooms by assigning clean-up times (4pm, 7pm and right before bed). These drills take less than five minutes and the results are overwhelming! to actually make this work. expenses hasn't resulted in more savings (or debt reduction). yourself, the savings never materialize. spur of the moment rewards. Change is inevitable. In order to survive, we must adopt change into our lifestyle (along with nutrition, relationships, work ethics etc.) What I don't get is how many people WANT change but never try to consciously change. So many habits. So many vices. So many viable options to drain away our lives, our finances, and our health. It's no great secret that the United States as a whole is spiraling into the red pit of international debt! Last year, I got fed up looking at all the money people throw away in school. 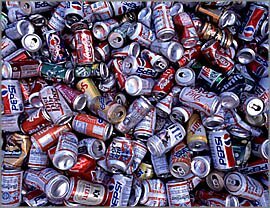 Soda cans and loose change litter college campuses everywhere! The irony is that college students are almost always "broke" and in need of some quick bucks. Last week, my daughter and I set about picking up recyclable cans around the campus. We collected 84 cans in total. Quick math: $4.20. Four dollars isn't much in this economy today but this is tax-free money we're talking about here. Change wise, I found 17 cents while collecting cans that day, bringing the total to 4.37. I am proud of DD because she is understanding the concept of money through bonding with "cheapskate mommy". She has helped me pick out energy saving bulbs, clean up clutter and sell it on ebay and half.com, perform comparison pre-shopping on the internet before I go out to the stores. My ingenious little darling is coming up with business ideas to stir up some more cash flow. She has started her own junior changepot for found money! If you find money in the street, put it aside from all the other cash you have on hand. When you get paid, pay yourself first for any habit you may have cut out (smoking in my case yields anywhere from $112 to $140 monthly before I pay anyone else). Separate that money and put it into an account or safe. This money grows quickly because we pay habits usually before ANYTHING ELSE- like essential groceries, rent, gas, etc. The key is to change the recipient of your hard earned cash to a plain bank passbook or drab grey box as opposed to Phillip Morris or Lorillard. I am close to having $1K in the bank from this alone. Time is passing soooo slooowly as of late. I've been concentrating more on home etiquette (keeping my house spotless) and less on actual work. It's gotten to the point where it takes me 10 minutes to get the house in order when I wake up and 10 minutes to prepare the girls for bed. I feel so much better though!! Hubby and I have been spending long amounts of time playing Onimusha:Dawn of Dreams as opposed to the usual weekend forays. This game is saving us tons of cash (we usually spend a few hundred every weekend). The changepot has now changed POTS! Total accumulated so far, you ask? 46 bucks since OCTOBER 2005. Thanks to all the folks who drop change on the floor and are too lazy to pick it up. TYTYTYTY!! The past couple of weeks have flown by. Hubby's got a bad injury and I've been helping him out and also keeping an eye on everyone else. When will someone watch me? Sheesh! Anywhoo... today marks seven months since I stopped partaking of that nasty habit. It's time for change!!! I have started new goals for the rest of this year (none of which include my previous businesses!) Let's see what happens.